This Burmese ruby and diamond ring was made by Raymond Yard, one of America's premier jewelers, during what is now referred to as the firm's "classic period", beginning in the late 1920's. It was at this time that Yard established himself with the American elite, including barons of industry such as John D. Rockefeller, Henry DuPont and Henry Flagler, and celebrities, like Joan Crawford and Douglas Fairbanks. It was also when Yard's own distinctive style emerged, this ring embodying all that made the firm a success. First and foremost, only the finest colored stones were selected for Yard jewelrysapphires from Kashmir and rubies, as in this example, from Burmawhich were carefully cut for maximum depth of color. Highly polished platinum settings using a minimum of metal, which created the illusion that the gems are floating in air, became another Yard trademark. Also seen in this ring, Yard utilized contrasting gemstone cuts, playing simple step cuts against sparkling brilliants, which lent his jewels an added lushness. As for the overall design, this ring is typical of Yard's early Art Deco rings, with a center stone that blends seamlessly with the shoulders and the shank, in one unified contour. 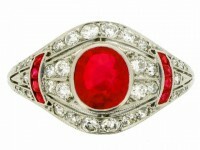 Yard rings of this period combined the Edwardian taste for intricate workmanshipdelicate piercing and millegraining-- with the Art Deco taste for bold contrast, as seen here in the play of pure red rubies against white diamonds and platinum, and in the various straight and curvilinear geometric forms. Finally, each piece was executed to the height of perfection, as Yard believed that even the slightest flaw greatly diminished the beauty of a piece of jewelry. To this day Yard's combination of faultless quality and ingenious design is unsurpassed, and his particular brand of restrained luxuriance continues to be treasured. Natasha Kuzmanovic, Yard: The Life and Magnificent Jewelry of Raymond C. Yard, Vendome, 2007.